Since the UAE is a desert country and the weather is typically warm and sunny, rainfall is infrequent and does not last for a long period. It mostly rains during the winter period between December and March in the form of short downpours and occasional thunderstorms. 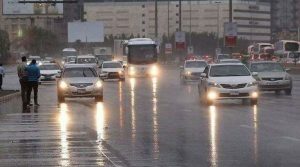 However, as early as mid-October last year, at the tail-end of summer, rain was reported in parts of the country, from Mirdif, Hatta, Al Faqa, and Mazyed to Masafi, Al Falah, Mohammed bin Zayed City and Al Dhafra area in Abu Dhabi, as well as some parts in the northern emirates. Residents have been enjoying the cool and occasionally rainy weather in the UAE for almost six months now. They are enjoying an “extended cool period” because of the rains. Rain, through cloud seeding which has been implemented in the UAE since the 1990s, will definitely boost the country’s water supply and help mitigate its reliance on seawater desalination. In a recent op-ed column published by Khaleej Times, Dr. Abdullah Ahmed Al Mandous, NCM director, noted that according to UN, almost half of the world’s population could face high water stress by 2030. This is the reason why the UAE has been collaborating with some of the leading global institutions to explore how research and development could ensure water security, Dr. Al Mandous explained. “Nearly three decades on from its initial work on cloud seeding… we are proud to continue to advance the vision of the leadership in leveraging cloud seeding for water security,” he added. Dr. Al Mandous said the NCM is developing a unified model that integrates studies of micro physics, cloud chemistry, and cloud electrical properties. The model is expected to be operational by the end of 2020. “The whole exercise will improve the quality of cloud-seeding operations and also provide sustainable solutions to challenges in the wake of water scarcity,” he underlined. Meanwhile, authorities, including the police and road safety experts have been continuously sharing safety advisory and tips for driving during unstable weather conditions. What starts as mild showers can escalate to heavy downpours by the end of the day and dusty conditions can cause poor visibility and fog, especially during rush hour in the mornings.